I don't have this volume in hand yet, but I plan to soon. 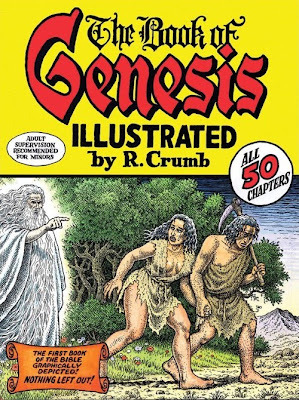 Yes, that icon of Lowbrow Art, R. Crumb, has published an illustrated volume based on the Biblical book of Genesis. For a number of reasons, this is tremendously exciting to me. 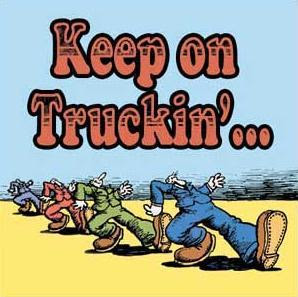 I knew from a pretty early age that R. Crumb and I were kindred spirits in a lot of ways. His description, in word and drawing, regarding his career as a school kid, made me like him right away. In high school, the cartoonist was a nerd who could not get a date. As his autobiographical drawings of his high school days illustrate, he was permanently wounded by his adolescent peers' rejection. Later I learned that, like me, he had experimented with LSD, and was a fan of female bodybuilders. 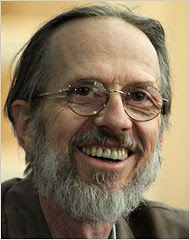 So, I have a lot of reasons to be interested in the work of R. Crumb. And I love the Bible, including the book of Genesis. So, the confluence of these two streams in the release of an R. Crumb Genesis Illustrated is just an amazing thing to me. I will be very interested to see how he treats subjects like the destruction of Sodom. HUGHES: Is God going to look like Mr. Natural? CRUMB: Nah. He has a white beard but he actually ended up looking more like my father. He has a very masculine face like my father. My problem was, how am I going to draw God? Should I just draw him as a light in the sky that has dialogue balloons coming out from it? Then I had this dream. God came to me in this dream, only for a split second, but I saw very clearly what he looked like. And I thought, ok, there it is, I've got God. HUGHES: And what did she look like? CRUMB: I went through that whole thing too; maybe I'll draw God as a black woman. But if you actually read the Old Testament he's just an old, cranky Jewish patriarch. It's a lot of fun doing Genesis, actually. It's very visual. It's lurid. Full of all kinds of crazy, weird things that will really surprise people. I will give a report on this volume after I've had a chance to look it over for myself. A Re-run, But Well Worth Watching! I've posted this before, but I cannot help posting it again. It is SO good!